OFFALY eyes were smiling last Sunday at Croke Park as the faithful’s hurling heroes smashed through the frontdoor in brainstorming fashion to clinch the Liam McCarthy Cup for the 4th time ever after an engrossing Guinness All-Ireland Final. The first ever All-Leinster decider attracted a massive crowd of 65,491 and magical Offaly certainly rose to the occasion as they whipped arch rivals Kilkenny out of sight in a rip roaring second half. Matters didn’t look all that bright at the break as the Cats, boosted by an instinctive Charlie Carter goal, led by two points,1-7 to 0-8. 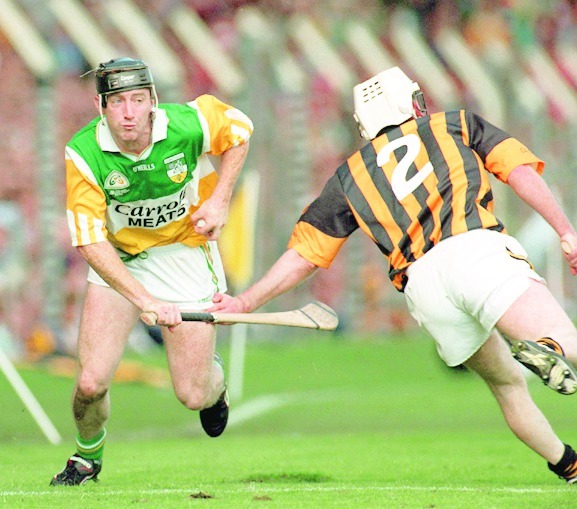 However, Offaly in typical never-say-die mode refused to yield and they turned on the style to rip Kilkenny asunder. Operating from a somewhat unfamiliar full forward role, flu-stricken man of the match, Brian Whelahan wreaked havoc and by the 46th minute the sides were tied at 0-12 to 1-9. Then Joe Errity took centre stage. The powerfully built centre forward glided past the despairing challenges of Canice Brennan and Willie O’Connor, withstood a crunching shoulder from Liam Keoghan, and he still managed to rifle home a sensational goal with a delightful and clever drop-shot. Bubbling with confidence Errity added a spectacular point from under the shadow of the Hogan Stand. Trailing by four points Kilkenny were in desperate need of inspiration. Ken O’Shea provided some respite with a fine point and in the 57th minute the Cats were on their ninth life as they won a penalty after Martin Hanamy got to grips with P.J. Delaney’s helmet and flipped him into the air. Kilkenny fans were purring with expectation but D.J. Carey’s strike flashed harmlessly over Stephen Byrne’s crossbar. Offaly retrieved their four points cushion - 1-15 to 1-11 - as Brian Whelahan and the mercurial Johnny Pilkington slotted over fine rallying points. But cute Kilkenny didn’t throw in the towel easily and points by Phil Larkin and D.J. Carey reduced the deficit to merely two. As the Cats dangled on the ropes Offaly came in search of the killer blow and it came in the 68th minute. Sub John Ryan set up Joe Errity but this time Errity’s drop shot didn’t reach it’s intended target. Fortunately the sliotar fell at the feet of the vigilant Brian Whelahan and from seven metres he beat Joe Dermody. Hill 16 erupted. Five points up - 2-15 to 1-13 - it was time for Offaly’s vocal and wonderful fans to prepare for the pitch invasion. Still, there was time remaining for some noteworthy incidents. Darren Hanniffy had a glorious goal opportunity thwarted by Dermody and then Michael Duignan scored a most magnificent point. It was the stuff that feeds dreams as he turbo-charged his path towards the Kilkenny goal and drove over a huge score. It was the icing in the cake. Offaly were champions. Kilkenny were totally dejected and licking their wounds. It was a truly amazing finale to an extraordinary but glorious year for the ‘Faithful’. It is ironic that Offaly, one of the biggest objectors to the backdoor championship system, are the first beneficiaries of it. And remarkably, to reach the promised land, they accounted for the champions of three provinces - Ulster, Munster and Leinster. That is an historic feat in itself. It is often said in sport that ‘your name is on the cup’ and it certainly held true for Offaly. They lost the Leinster Final poorly to Kilkenny and there was no hint of the transformation that was to come especially in the wake of the war of words controversy between Babs Keating and his players. Babs resigned. Offaly hurling was at rock bottom. It has been a real roller coaster year for Offaly. They destroyed Meath. Required a dramatic late Johnny Dooley goal to quell Wexford. Didn’t perform well in the Leinster Final. Lost their manager. Got a new manager. Did just enough to defeat Antrim. Drew with Clare when they deserved to win. Lost to Clare but didn’t. Jimmy Cooney blew the final whistle too early. A re-fixture was ordered for Thurles. And Offaly finally lowered the Banner at the third attempt. They then turned the tables on Kilkenny. A fairytale if ever there was one. Last Sunday was Offaly’s greatest and sweetest win ever in an All-Ireland decider. It was their most polished display in a final and it even surpassed the enormous heights reached in ’81 and ’94. They silenced their doubters and critics in emphatic style and maybe now they’ll get the credit and recognition they deserve. 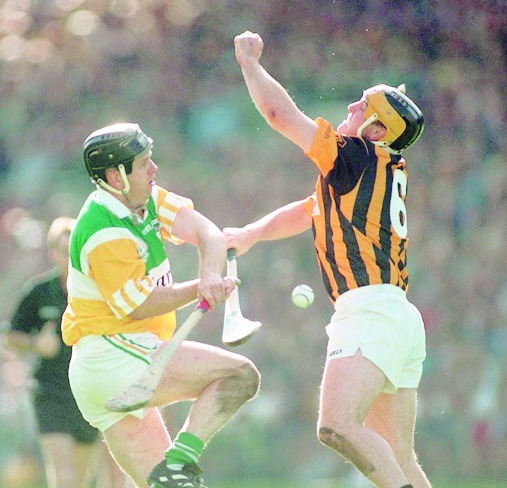 Offaly have won as much as any team in the nineties and that shouldn’t be forgotten. Maybe Offaly ambled along casually at times, but they have proved their greatness by winning two All-Ireland titles in five seasons. In the modern era and with the huge demands being placed on players it is virtually impossible to win All-Ireland titles back-to-back. But no doubt Offaly will have another good go at retaining Liam McCarthy. Kilkenny, too, played their part in what was a marvellous All-Ireland decider and but for some brave and tenacious Offaly defending they could have been celebrating their 26th success. Any time D.J. Carey gained possession he was smothered by mean markers in the shape of the superb Kevin Martin and Hubert Rigney. As early as the 6th minute Carey threatened to rattle the Offaly net but Kevin Martin got back to deftly flick the sliotar off the artful dodger’s stick. In the 15th minute Kilkenny were extremely unlucky not to have grabbed their second goal. Ken O’Shea’s inch-perfect centre reached the unmarked P.J. Delaney and somehow Brian Whelahan managed to avert the danger. If the Cats had nabbed a goal at that stage Offaly would have been in serious difficulty. Eight minutes before half-time Offaly netminder Stephen Byrne earned his spurs as he dived to his right to deny Ken O’Shea after a good handpass by Andy Comerford. Kilkenny must have wondered what they needed to do to breach Offaly’s resilient rearguard in the early minutes of the second half. Byrne made an early stop from a pretty harmless effort by Comerford, and then we witnessed defensive qualities of the highest calibre as Kevin Martin blocked shots from Comerford twice in succession and then Simon Whelahan dived in to nip Charlie Carter’s effort in the bud. It was exemplary pressure, worthy of the All-Ireland stage and it had the crowd glued to the edge of their seats. The Cats piled on plenty of pressure but they were forced into very hasty shooting and they clocked up seven of their eight wides in the opening 18 minutes of the second half. Brian McEvoy, who had a great first half, was guilty of two desperate misses, while Andy Comerford, Charlie Carter and Pat O’Neill also fluffed good opportunities. Then there was the 58th minute penalty. Kilkenny needed a goal badly but D.J. Carey, who was held scoreless from play, drove his effort over the bar. A point wasn’t enough to raise Kilkenny’s flagging challenge and Offaly finished very strongly, something which has become their trademark. Like Kilkenny, the ‘Faithful County’ saw gilt edged chances go astray. Two glaring goal opportunities stand out. The match was only twenty seconds old when Billy Dooley was denied by Joe Dermody and in the 69th minute Dermody rescued Kilkenny as a move involving John Troy and John Ryan ended with Darren Hanniffy driving his shot into the advancing keeper’s backside. Some of Offaly’s point taking was scintillating. One of the best came in the tenth minute. A much improved Johnny Pilkington handpassed the sliotar to Brian Whelahan and he drilled a low pass into Joe Errity who swiftly gained possession, turned Pat O’Neill and pointed. It was a score of the highest quality. While Brian Whelahan now has the unique distinction of being named man of the match in four All-Ireland senior finals - in ’94 and ’98 with Offaly, in ’95 and ’98 with Birr - it was a huge team performance that saw Offaly get the better of the Cats. Everyone played their part. There were no weak links and the tactics and moves devised by Michael Bond and his co-selectors Pat McLoughney and Paudge Mulhare worked a treat. They wasted no time in moving Brian Whelahan from his customary right half back role in a switch with Michael Duignan. Brian McEvoy was causing serious headaches for Whelahan, but while upfront he frightened Kilkenny any time the sliotar was threaded into his path. Duignan, while he afforded McEvoy latitude, read the game particularly well and he did a lot of sweeping up culminating with his majestic second point in the dying moments. In the 12th minute, Joe Errity moved out to centre forward with John Troy going into the fringe of the square. Errity certainly broke Canice Brennan’s dominance and he prospered scoring the all-important goal that brought Offaly to life. After scoring three superb points against Clare in the re-fixture Gary Hanniffy was always going to be in line to start, but unfortunately things didn’t go too well for him and he was replaced by Paudie Mulhare who was particularly brilliant in the final 20 minutes. Such was the superiority of Offaly’s defensive unit Kilkenny were forced to switch D.J. Carey to centre forward before half-time. He then had a spell at full forward with P.J. Delaney moving out to the wing and the fact that Ken O’Shea and Andy Comerford were replaced speaks volumes for the contribution of Offaly’s tight marking sextet. Considering the soft underfoot conditions and the swirling breeze this All-Leinster All-Ireland Final will be remembered for many years to come. It was tough and hard fought, but there was no malice, and the only player to be booked over the seventy minutes was Martin Hanamy after the incident that led to the game’s only penalty. No doubt, Offaly will savour this victory for a long time to come. After July 5 very few in the county thought we’d see this day. It just goes to prove that the ‘Faithful’ never dies. Uíbh Fhailí Abú. Another of the new kids on the block. Didn’t secure his place until the All-Ireland series and he has been a revelation since taking over at number two from his younger brother Barry. Charlie Carter had the measure of Simon in the first half, but in the second half it was an altogether different story as the Birr clubman gathered ball in the air, blocked, hooked and harried and dived in where other players would be reluctant to put their hurl. Has a great future. Rating - 8. The giant Seir Kieran fullback was a monumental tower of strength. He gave none of his markers a look in, particularly P.J. Delaney and later D.J. Carey. It is remarkable how Kinahan has flourished since returning to fullback since the Leinster Final. Always the man for the big occasion he has never let Offaly down when it counts most. He made some brilliant fetches under pressure and his clearances were well directed. Picked up a bad facial knock but that didn’t deter brilliant Kinahan. Rating - 8. Pound for pound the best corner back in hurling. Martin Hanamy was at his brilliant best as he burst out of the left corner on many occasions leaving Ken O’Shea, who was substituted, in his slip stream many times. Hanamy was the only player to be booked in the final but few could blame him for his actions as a Kilkenny goal looked certain until he knocked over P.J. Delaney. Made a really vital interception late on when Niall Moloney came raiding. Some were disappointed he didn’t go to meet Charlie Carter when he scored the Cats goal, but that aside Hanamy was superb. Rating - 8. Hit by a bout of the flu 24 hours before the match it seemed as though Brian Whelahan wasn’t going to play a part in the final. However, it takes a lot to keep Sid down and he played a starring role especially after he moved to full forward. Didn’t look himself in defence and was given a horrid time by Brian McEvoy. Still he cleared a ball off the line during his so called bad spell. Whelahan’s deft skills, intelligent thinking, quick wrists and distribution left Kilkenny in turmoil. He finished the final with 1-6 to his credit, 1-3 from play, and that is a great return. Where will Whelahan get his All Star this year? At number 5 or 14? Or maybe as a goalie? Remember his penalty save from David Fitzgerald! A superb all rounder. The most complete player in hurling. Forget the first twenty minutes. This was an awesome display from a special player. The best of our generation, if not the greatest of all time. Rating - 10. The Offaly captain is highly under-rated. Andy Comerford caused endless problems for Waterford but Rigney just snuffed out the threat presented by the Cats forward completely. A strong performer in the air. Very little low ball passed by him either. He also made several interventions and vital blocks. Gets about his business quietly but effectively. An unsung hero who deserves all the recognition he gets. He made a fine acceptance speech and didn’t lie down after the early knock he sustained. This epitomises Rigney’s character and determination to succeed. Rating - 9. Very unfortunate to have been pipped by Brian Whelahan for Man of the Match. He was excellent defensively and he used his power and physical presence to great effect. Didn’t shy back from tackles and made two crucial blockdowns in succession on Andy Comerford early in the second half which lifted Offaly. Made some great clearances and it is no mean feat that he kept the much vaunted D.J. Carey very quiet. Martin has had a superb year and he should be in line for his second Allstar award. Don’t forget he also completely overshadowed Jamesie O’Connor. An exemplary man marker. Rating - 10. Johnny has had his critics all year but once again he came up trumps when all the questions were asked. He worked himself to a standstill last Sunday and Philip Larkin wasn’t near as influential as he was in the Leinster Final. Johnny picked up an awful lot of loose ball and he delivered some great passes into Brian Whelahan in the second half. He must have been really pleased with himself after scoring a great point in the dying minutes. Rating - 8. The going was very tough last Sunday and Johnny paid the price as he sustained two heavy knocks. Like Pilkington he did an awful lot and dropped deep on many occasions to help out the Offaly defence. Very unusual that he didn’t feature among the scorers but in his midfield capacity Johnny hasn’t had the same opportunities. His battling qualities and work rate have been very good and we didn’t see very much of his direct opponent Peter Barry last Sunday. Rating - 7. This has been Michael Duignan’s best year ever in an Offaly jersey. A very versatile performer. He scored Offaly’s first and final point and they were both memorable scores. While he didn’t man-mark Brian McEvoy when he switched with Brian Whelahan, Duignan read the game superbly and his distribution, as ever, was very intelligent and it helped the Offaly forwards create openings. He was another of Offaly’s top performers and featured prominently in the shake up for man of the match. Rating - 9. Troy started well but when Canice Brennan began to get the upper hand the Offaly selectors switched him to full forward. Scored a neat point after a good move between himself and Brian Whelahan. Missed a favourably positioned free and there was very little in another strike he had at the posts. Tried hard to make things happen and showed improvement on his display against Clare. Rating - 7. Little went right for Gary Hanniffy. He struggled to adjust to proceedings and was replaced by Paudie Mulhare. It was a gamble by the selectors to start Hanniffy but on his display in Thurles you couldn’t overlook him. Still, his best performances all year were when he came in off the bench. Has plenty to offer. Is strong and athletic and the experience will stand him in good stead. Rating - 6. He had a ding dong battle for much of the match with Willie O’Connor before he had to go off injured. Didn’t score but still worked hard. Unfortunate he didn’t get a goal just twenty seconds after the throw-in. When one considers the freedom and amount of clearances Willie O’Connor has made in previous matches Billy did a good job and he wasn’t afraid to mix it. RATING - 7. Did his best hurling when he switched out to the forty. Scored one great point off Pat O’Neill after a majestic pass by Brian Whelahan. Ensured that Canice Brennan wasn’t a dominant force. Ran at Kilkenny any chance he got. Took his goal brilliantly and it was this score that turned the tide in Offaly’s favour. His point just seconds later left Kilkenny dangling on the ropes. Also instrumental in the second goal. Considering that Joe is more noted as an accomplished defender he did some job as an attacker and it was a very special day for him as even though he has been around for a while it was his first time to start an All-Ireland Final. RATING - 9. Joe Dooley’s performances have almost defied logic this season. He scored five brilliant points in the re-fixture victory over Clare and worked really hard last Sunday scoring two vital points. 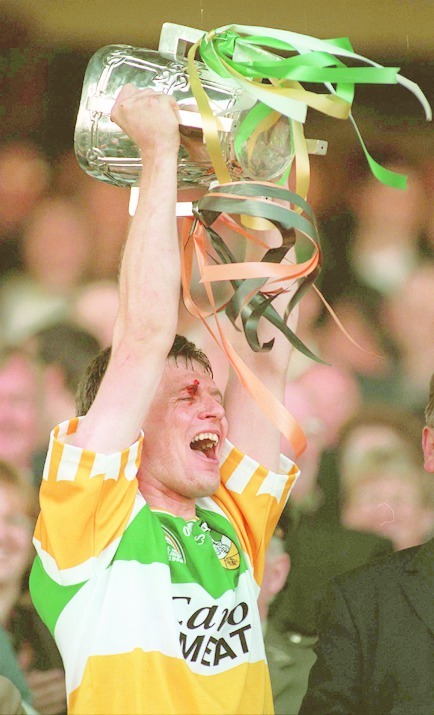 He now has three All-Ireland medals, having won his first in 1984, and he is guaranteed a place in the Offaly G.A.A. Hall of Fame. RATING - 8. Introduced for Gary Hanniffy late in the first half Paudie made a very positive impact. He dug deep in the closing twenty minutes winning important possession and relieving pressure off the Offaly backs. It was a dream performance especially considering the way things went for him in Thurles just a week after the sudden death of his father. He has a great heart and he doesn’t give up easily. Another player with a great future. He has come of age this year. RATING - 8. Had a great chance to grab a late goal and probably should have side-stepped Joe Dermody. He will have learned an awful lot from this year and will be an important part of the Offaly set-up over the next few years. Publicly criticised by Babs Keating, John Ryan has proved that he has what it takes to make it at the top level. Was involved in two very promising moves after his introduction. One resulted with Brian Whelahan knocking home his goal and in the other he set up Darren Hanniffy. Very strong and forceful and a good distributor of the sliotar.